I love wandering the trails in canyons, forests or deserts; discovering where the paths might lead and what visual treasures await my eyes and camera. Scott Walton is a reformed large format photographer who has honed his skills with some of the best photographers in the US (e.g. Fred Picker, Charles Cramer, Bruce Barnbaum, Brooks Jenson and John Sexton). He has travelled extensively in the US and has a formidable collection of images from the national parks. After we saw Scott's work in a recent 4x4 portfolio, we had to find out more! I earned a BA in photography from the Ohio State University in 1988 and worked at a commercial photography studio for ten years. I was interested in photography even as a young boy although mostly just fascinated with the equipment. My Grandmother was a shutter bug and gave me an old Kodak Bantam folding camera that used 828 roll film. I used to carry it around and “take” photographs even when it wasn’t loaded. I’ve tried to keep a very high level of quality in image production. I’ve followed the classic ‘west coast school’ of straight landscape photography for almost thirty years now, most of that time using 4x5 view cameras with film. With my background in studio photography starting in the days of film and darkrooms, I’m proud of having worked in the traditional processes, following in the footsteps of the many photographers who have inspired me over the years. I’m proud of having worked in the traditional processes, following in the footsteps of the many photographers who have inspired me over the years. Now with my conversion to digital capture, I still approach field work with the same methodology as I did with the view camera. And I try to print with the same high level of care and quality of production that has been a hallmark of the traditional “large format” style. The first was a photographic workshop in 1992 in Vermont with Fred Picker of Zone VI Studios. This was the first workshop I’d ever attended and my first exposure to people who were living life as creative photographers. Fred assembled a terrific group of co-instructors and it really opened my eyes to what was possible and the dedication these serious artists had for their craft. It was the first time I experienced looking at so many fine prints that my eyes were tired and my head hurt at the end of the day. This was at a time when I was working at a commercial photography studio in Ohio and even though I was earning my living from photography, this exposure to creative photographic artists was new to me. I returned from this experience, put away all my other hobbies and began a much more serious pursuit of the landscape and dedication to producing fine prints in the darkroom. My next workshop four years later really qualifies as that second moment you describe. Led by Bruce Barnbaum and another fantastic group of assistants, it was my first real exposure to the amazing light and spirit of the southwestern US canyon country. I really did fall in love with the southwest and have maintained an ever widening circle of exploration of the Colorado plateau including significant travel in the western US continuing to this day. Growing up in Ohio I never understood why the light and skies didn’t look the same as I saw in pictures from the west coast photographers. It really was a revelation upon traveling to New Mexico, Arizona, Utah and Colorado, etc., that the light was indeed special and one could produce images with the clarity and ‘magic’ that I saw in many of the photography monographs I was collecting. Somehow, encountering the landscape with a camera makes the experience more real to me. Perhaps because of the artefact that persists after I’m home and perhaps it’s the intense concentration while afield that deepens the memories. Sometimes while working behind the camera I do have to consciously stop occasionally and really appreciate where I am and try to enjoy the experience; which is something I’m trying to do more intentionally now. Like so many others no doubt, the images of the west coast photographers Adams, Weston and their contemporaries I first encountered while pursuing my photography degree set me on the path of my own exploration of the classic landscape photography subject matter. I did work in commercial photography for many years and have also worked in media production, IT and live event production. I’ve basically always been a behind the scenes media, audio and visual production guy. 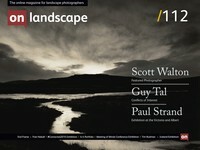 What is, for you, the appeal of landscape photography? What impact has it had on your life? Photographing the landscape lets me do something I love in places that I love to be. The impact on my life has been profound. Photographing the landscape lets me do something I love in places that I love to be. The impact on my life has been profound. My deepest friendships are with some photographers who I’ve met on these workshops and have stayed in touch with and photographed with almost annually for going on 20-25 years now. Because of their own explorations, these guys have taken me to places I never would have gone. So my life and photography have been enriched immensely because of these associations and a shared love of landscape photography. I always hope that my images will challenge and encourage viewers to undertake their own explorations in the out of doors, either with or without a camera. I believe that pursuing beauty in art is a worthy goal and is one of man’s highest expressions. What we experience in the natural world and when viewing images of that world can be transformational and I certainly feel “re-created” whenever I can spend time outdoors. These days I carry a Pentax 645Z with lenses from 35mm to 200mm. I also have a Canon 6D which I got for using lenses wider than what the Pentax can handle. I still try to approach the landscape as I did when a view camera was in my pack, which means I use a viewing frame to identify the picture and only setup the camera after doing the creative work of finding the place to stand and basically where to put the edges of the picture. Even though landscape photography with a view camera has often been described as a slow, contemplative process, I’ve always found it to be a fast paced process actually. With clouds and light changing so fast, it’s amazing how many times I just barely get the picture captured before everything changes. So, the digital workflow has certainly helped that because they are faster to operate with fewer lens changes, in camera metering, no film holders to manage, etc. I also have a tilt shift adapter for the Canon allowing me to use the Pentax lenses. So when I absolutely need lens tilt for focus control as I always had available with the view camera, I now have that again which is wonderful. Previous to my conversion to digital capture, I used 4x5 film. For B&W images I printed in my home darkroom and for colour I would send transparencies out for a drum scan and then I would do the processing in Photoshop and print on my Epson. Standard controls mostly in Photoshop to mimic what I was used to doing in the darkroom; mostly a loose selection with a curve for density and contrast changes and a custom action from Charlie Cramer to handle sharpening. I have quite a catalog of 4x5 images so those are still tweaked and printed in Photoshop. Now with digital capture I bring everything into Lightroom and I find that especially with the 2012 process version, it’s so powerful that most processing can be handled quite well inside of Lightroom. I occasionally roundtrip to Photoshop if there is complex cloning or something else needed like a particular selection with a curve, but that is rare. Sometimes I do focus stacking so those files are roundtripped through Zerene stacker which does a great job. In all cases I aim for a natural look and try not to be too heavy handed. So many images only live now for a computer screen but I really like fine prints and do print quite often. I currently have an Epson 7890 so I can print things here at home and I really enjoy that convenience. I occasionally send out for a Chromira or LightJet print if I want something on the excellent Fuji Crystal Archive Super Gloss paper. I really love that super gloss finish and the metallic look that paper achieves. Who (photographers, artists or individuals) or what has most inspired you, or driven you forward in your development as a photographer? What books stimulated your interest in photography? In my earlier days I bought a lot of photography books, mostly monographs and in those days I lived in a large city with a great museum that showed a lot of photography. So I was inspired Ansel Adams, The Westons, Paul Strand, Paul Caponigro, Michael Smith and Paula Chamlee, Fred Picker and Howard Bond. A little later I stared to become familiar with some of the more contemporary west coast landscape photographers like John Sexton, Bruce Barnbaum, Ray McSavaney Huntington Witherill and Jay Dusard. I have books by all these guys and especially the books by John Sexton had a very profound impact on me, particularly his Listen to the Trees which resonated with me because I love to hike and explore in forests and trees were a favorite subject already. Sexton’s imagery showed me what was possible and set a very high bar, both technically and aesthetically. Can you choose 2-3 favourite photographs from your own portfolio and tell us a little about them? This is my oldest successful landscape image and is really special to me for several reasons. First, the Old Man’s Cave Hocking Hills area was one of my main photographic destinations when I lived in Ohio. My father was with me when I made this picture. He carried my camera up and down quite a lot of steps to get into this gorge and waited patiently through all the view camera manipulations. The two trees kind of represent he and I that day. Finally, one of these trees is no longer there. It loaded up with ice one winter a few years after I made this image and the trunk snapped in two; so it’s always a reminder that life and subject matter are fleeting and you need to capture them while you can. I’ve been fortunate to spend a decent amount of time in Yellowstone over the years, thanks to a good friend who had a home in the Tetons and the relatively short drive into Yellowstone from Jackson Hole whenever I visited him there. We were photographing together one day and he wanted to show me this particular stand of trees he had photographed previously. This frosty autumn morning we were rewarded with a nice mist rising, wonderful backlight, amazingly open shadows and lasting memories of sharing the light with good friends. I’ve spend so much time in the slot canyons of Arizona and Utah. They are such wonderful places, it’s no wonder photographers the world over come to experience the magic. I started going in the mid 1990’s before they became quite the overcrowded attraction they are today. And frankly, once you’ve seen a few of them, they start to all look a bit alike. There are always exceptions however, like this wall detail I found in Waterholes canyon outside of Page, Arizona. Located on Navajo land and requiring a permit, Waterholes is the kind of slot that’s more open on top and I’ve found the wall details to be more interesting than the passageways and it doesn’t really have rooms or chambers like some do. It’s these kinds of details that help fill out your impression of a place and put the experience into a more personal context. How easy – or difficult – do you find it to fit your photography around work and other commitments? When you travel for work, are you able to devote any time to either photography or researching new places? Most of my photography for the last 20 years has been accomplished during 2-3 annual trips of 1-2 weeks duration each and I find getting away from the routine which allows concentrated and uninterrupted concentration on photography to be particularly helpful. Unfortunately the area where I live has not been as inspiring for me as I would like despite constant attempts so I find travel in the western US brings me to the subject matter and conditions that have allowed me to respond creatively. I am rarely without a camera though and have always taken advantage of business travel to carve out some days for photography. On several occasions I’ve accompanied my wife on her business trips and have been able to get away while she’s attending her conference to photograph somewhere interesting. How do you like to approach your image making? Do you pre-plan and go out with something in mind, or do you prefer to let your photography flow from your explorations on foot? have always believed that it’s better to photograph what you find, rather than what you have in mind because things often don’t turn out as expected and you have to stay open to whatever is presented to you. I have always believed that it’s better to photograph what you find, rather than what you have in mind because things often don’t turn out as expected and you have to stay open to whatever is presented to you. So I’m big on wandering around and exploration, letting a place speak to me. Of course, there are plenty of exceptions to that. I might be after Aspen trees or sand dunes so you have to put yourself in the right place at the right time for the best conditions. And sometimes I’m going somewhere that requires lots of research and pre-planning in order to make sure you give yourself the best chances and don’t risk wasting the trip. But sometimes that approach is so stressful and the ones where I just relax and see what happens are not only much more relaxing but quite often end up very productive with more personal images. If you had to take a break from all things photographic for a week, what would you end up doing? Hopefully get to go exploring outside somewhere. Yes it would kill me to not have the camera but it’s really where I want to be so hopefully getting to rejuvenate in nature would be the thing. How important do you find it to be in the right frame of mind? Have you found ways to work around periods when your mind is busy with other things? It’s not something I’ve had a problem with I guess. Since I gear up for a few trips a year, I’m always ready when the time for a trip rolls around; no problem being ready for it. Do you print many of your images and how do you choose to do this? I should really print more than I do, in fact I’ve recently been challenged to make printing a regular part of my work flow for each image, even if I don’t “need” a print. The idea being that since a fine print is an ultimate destination, it’s best to work it up in print form rather than just on a computer screen. It’s easy to make something look good on screen but takes work to make a satisfying fine print. Once you have that finished print, the file will still look great on screen so you have the best of both worlds. I have an Epson 7890 at home so it’s easy and convenient for me to make a print any time I want to. I’m trying to make an effort to concentrate less on the iconic locations in the future and make more personal images. I’ve always tried to do the personal, meaningful images even when I’m in a place like Yosemite, for example. The idea being that you’re in Yosemite but not have the images necessarily look like it; usually by concentrating on smaller and middle distance details. But in the near tern I think I’ll try to explore more out of the way locations. For example, last Fall I was driving through the desert between Valley of Fire north of Las Vegas and Mono Lake in California. I had wonderful storms and light and made some images that are very special to me and totally not recognizable as being from anywhere other photographers would generally know. Which photographer(s) – amateur or professional - would you like to see featured in a future issue? If you haven’t already shown their work, I think your readers would really enjoy Charles Cramer (who's talking at our Landscape Photography Conference this November) and Huntington Witherill. I can’t say enough about how these two have helped me and what they’ve meant in my life and photography.